One of the bigger trends in the last couple of years is to re-release older games with a fresh coat of paint. Sony probably did it more than anyone else by doing HD updates to several of their PlayStation 2 classics. 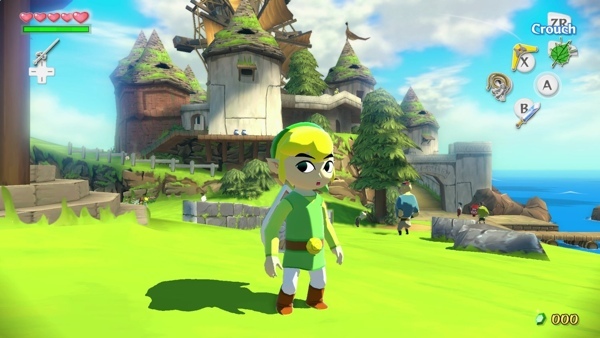 And now, only a year after the Wii U was released we are seeing one of Nintendo's first forays into this category with an update to a Gamecube classic, The Legend of Zelda Wind Waker HD. Can you believe its already been ten years? It feels like just the other day I put a mini-disc into my purple Gamecube and enjoyed the epic adventure of Wind Waker. It was by far the best game to ever to hit the console and its no surprise that this would be one of Nintendo's first choices for an HD update. The first thing anyone is going to notice, whether or not you played it on Gamecube, is how gorgeous this game is. Back in 2003 when it was originally released the cel-shading was quite the topic of discussion, but now in 2013 I can't imagine it any other way. Nintendo has done an incredible job of updating everything from character design to lighting, making a ten year old game feel new again. Wind Waker isn't about being the most detailed game in the world, but it thrives on its incredible color palette that lends itself to the game's story. Visually the game is absolutely stunning and can stand up to any Action RPG out there today. Outside of the visual department, the rest of the game feels mostly unchanged. You would think for a ten year old game that things would feel dated but surprisingly the game is still fresh. The fighting mechanics still remain the best in the genre using smart lock-on mechanics and varied enemy types. Even having played this game before, the experience felt unique from start to finish. One of the best aspects of Wind Waker is the variety. Along with the combat the games incredible puzzles are back and hold up beautifully. Later in the game the puzzles become more challenging and bring out some of the best dungeons in a Zelda game to date. There are only a few minor gameplay updates that differentiate this version from the original. The first is inventory management which you can do using the Gamepad rather then having to pause and scroll through a bunch of menus. Now its as easy as dragging items from your inventory to an active slot. You can also use the gamepad as the main screen in case you want to take the experience to another room. The other big gameplay change is the sailing which has been sped up quite a bit. My biggest gripe with the original experience were the lengthy ship sequences which are at least somewhat shorter now. What impresses me more then the visual/gameplay updates is the fact that Wind Waker HD still can compete with any new game on the market today. The story is charming, the characters warm your heart, and the game remains as one of the best 3D adventure games to date. With the lack of killer software on the Wii U, The Legend of Zelda: Wind Waker HD is one of the only great games currently available to date. It has been a long time since exploring, fighting, and adventuring has so consistently brought a smile to my face. Breath of the Wild is such a wonderful experience that once you play it, you will likely never look at open world games the same again. Twilight Princess is a game I would consider one of the best of all time. It may not have the same impact as Ocarina did, but this is by far one of the best games I have ever had the privilege to play, and I think will be one that is talked about and remember for a long, long time. You may be put off by the game’s visual presentation at first, but once you become aware of how well it works, you’re simply left with yet another classic game in an already classic series. The navigation, the combat, the dungeons, the characters, and the peril you must face as that young elf boy in green are all fantastic. Link can certainly wake wind, and if all Saturday morning cartoons could provide the exhilaration that this game does, Link could possibly manage to wake me up on the weekend. Until then, a lot of very late mornings will be spent enjoying this masterpiece. Hyrule Warriors masterfully blends the combat and gameplay of the Dynasty Warriors series with the lore and characters of the Zelda universe.